I’m raising capital for a start-up consulting business. I have 18 years consulting experience and, throughout, the assignments were provided by my conglomerate employer. I understand cultivating each client takes a year. I do have a house as collateral for a loan. My mortgage represents 72% of the current property value, and there are no savings after repayments and living expenses. I have 4 similarly-qualified people joining me, all critical to this venture, with each possibly defecting for a $220,000 salary. I’ve found a city office at $40,000 pa. What are my capital raising options? A critique would assist. 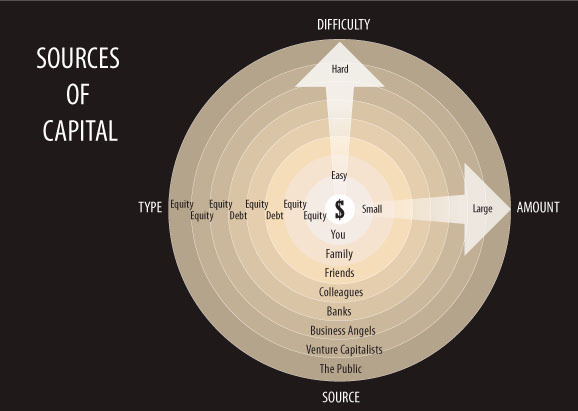 An entrepreneur has eight capital sources, each progressively harder to secure: himself, family, friends, colleagues, banks, business angels, venture capitalists, and the public. First, without his own savings, an entrepreneur is forced to ask family. Perhaps his frugal aunt is convinced but, if not, he must approach friends, a tougher proposition. Maybe a work colleague with an entrepreneurial itch might invest. If no luck there, then the money search turns to banks with their vaults of strangers’ savings. Since banks try to be conservative with others’ money, property is required to back most loans. From there, it’s to business angels, sophisticated investors with their own savings. Thereafter, one approaches venture capitalists, professional investors of others’ savings. Finally, money is raised from the public. This proposal suffers two flaws. First, the aspirant has no savings to invest. This self-elimination as a funding option instantly removes venture capitalists and business angels who require “skin in the game.” The aspirant’s inability to save and high mortgage to property value raises serviceability and capacity red flags with banks. Second, the proposal is ill-conceived. It shows a $1.1 million year-one cash burn, no capital to fund it, no management or marketing team, and no clients. This will spook colleagues, including the possible four, and hopefully warn friends and family. Finally, the public markets are inappropriate here. An entrepreneur failing to invest is a dreamer looking for a job. The plan itself is correctable. The founder’s lack of investment is fatal.